Error 1321: The Installer has insufficient privileges to modify this file C:\Windows\system32\Macromed\Flash\FlashPlayerTrust\AcrobatConnect.cfg. Action 11:21:48: InstallValidate. Validating install Action start 11:21:48: InstallValidate. Error 1321.The Installer has insufficient privileges to modify the file C:\Windows\system32\Macromed\Flash\FlashPlayerTrust\AcrobatConnect.cfg. Action ended 11:21:48: InstallValidate. Return value 3. The Adobe Creative Suite 3 installer was unable to access the file or directory identifed in the error message. The folder or file causing the error can be identified in the Adobe Creative Suite installation log. For additional information on finding and reading the installation log, please refer to the section, "Adobe Creative Suite installation log." The solutions below reference the most common locations of the errors. Update the user privileges to files. Important: The file path in the error messages appears immediately after, "to modify the file" or " open the source file". The parent folder is immediately before the file referenced in the error. In the error messages above, the parent directory to the 1321 error would be "FlashPlayerTrust". Perform the steps below on the parent folder containing the file. In the example below the folder is FlashPlayerTrust. The path to the FlashPlayerTrust folder is C:\Windows\system32\Macromed\Flash\. In Windows Explorer, navigate to C:\Windows\system32\Macromed\Flash\. Right-click the FlashPlayerTrust folder and select Properties. Important: If you are unable to see the FlashPlayerTrust folder we proceed to the section, "To show hidden files and folders" then continue with step 3. In the FlashPlayerTrust Properties window, select the Security tab. Important: If you do not see this option please proceed to the section, "To disable simple file sharing" then continue with step 4. Select Administrators (1) under Group Or User Names. If Allow is not selected for Full Control in the Permissions list, change the access control level to Allow Full Control (2). Select SYSTEM (1) under Group Or User Names. If Allow is not selected for Full Control in the Permissions list, change the access control level to Allow Full Control (2). Select Replace Permission Entries On All Child Objects With Entries Shown Here That Apply To Child Objects (1) and click OK (2). If a Security dialog appears, click Yes to continue. Click OK to close the FlashPlayerTrust Properties dialog box. Install Adobe Creative Suite 3 products. If you disabled simple file sharing in step 3 please proceed to the section, "To enable simple file sharing." If you enabled the option for showing hidden files and folders in step 2 please proceed to the section, "To hide hidden files and folders." Wait 5 seconds and turn the computer back on. Press and hold down the F8 key the second the Windows Logo appears. Note: You can also press and hold F8 a few moments before the Windows Logo appears. If Safe Mode does not appear in the corners of the desktop you are not currently running in Safe Mode. Please reboot and try the process again. Using the arrows keys, select Safe Mode with Networking and press Enter. Proceed to the section, "Windows XP Professional". Important: You must restart the computer before proceeding to step 9 Install Adobe Creative Suite 3 products. In Windows Explorer, navigate to C:\. Right-click FlashPlayerTrust and select Properties. In the FlashPlayerTrust Properties window, select the Security tab (1). Click Advanced (2). In the Advanced Security Properties For FlashPlayerTrust window, select the Owner tab (1). Click Edit (2). Select the Administrators group (1) under Change Owner To, select Replace Owner On Subcontainers And Objects (2), and click OK (3). If a Windows Security dialog appears, click Yes to continue. Click OK to close the Advanced Security Properties for FlashPlayerTrust window. Click OK to close FlashPlayerTrust Properties dialog box. In the FlashPlayerTrust Properties window, select the Security tab. Click Advanced. 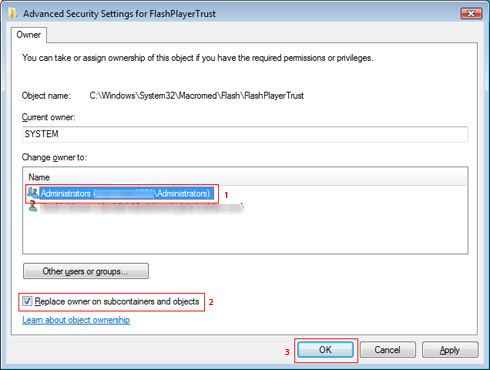 In the Advanced Security Properties For FlashPlayerTrust window, select the Permissions tab (1). Click Edit (2). Verify that the value of the Perimssions column for SYSTEM and Administrators say Full Control. If the value does not indicate Full Control. Uncheck Include Inheritable Permissions From This Object's Parent and click Apply. Note: You may encounter a few dialogs to confirm that action. Please copy the permissions and accept any security warnings. Select Replace All Existing Inheritable Permissions On All Decendents With Inheritable Permissions From This Object (1). Click OK (2). This method can be used on all versions of Windows but requires use of the command prompt utility. Note: You must elevate the level of permissions for Windows Vista with UAC enabled. Choose Start > Programs > Accessories. Right-click on Command Line and select Run As Administrator. Use the following commands, including quotation marks, and press Enter at the end of each line. Important: Ensure to enter spaces between /T, /E, /C and /G in the third line. The Adobe Creative Suite 3 installer log contains detailed messages on why the install failed (or succeeded). The log file can help you diagnose the problem faster. Every attempted installation will append information to the previous installation log. Deleting the current installation log and running the installation again can simplify the troubleshooting process. The log file is created on both Windows and Macintosh. The error messages contained will defer in format because of Operating System differences. Navigate to the Adobe Creative Suite 3 log file. Decompress the Adobe Creative Suite 3 log file. Important: The log file is archived using a compression utility called gzip and will require a decompression tool such as Winzip or WinRAR. Search the log file(s) for Error 1714 and Error 1704. Record the paths identifed near the error message. In Advanced Settings, select Do not show Hidden Files And Folders. Select Start > My Computer. In the Advanced Settings, deselect Use Simple File Sharing. In the Advanced Settings, select Use Simple File Sharing.